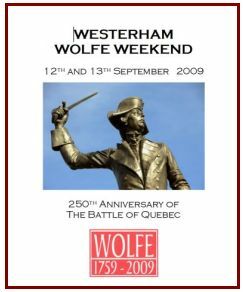 In September 1759, General Wolfe commanded British forces at Quebec in Canada and fought the French under the Marquis de Montcalme. Wolfe died of his wounds at the moment of victory and Montcalme died a few days later. During September 2009, a weekend of commemorations was held at Squerryes Court and Quebec House. Re-enactors camped in an 18th century village in Wolfe Park and the “New France Old England” society recreated battles from Montmorency and Quebec over the weekend. Re-enactors from The Mannered Mob brought 18th century life Wolfe’s family home, Quebec House. On Sunday morning a service of memorial for both commanders and those who took part in the battle took place on the Green and in St Mary’s. Re-enactors from New France Old England at Squerryes. Click on image to see report. 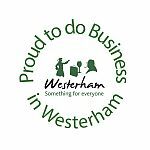 3500 people came to Westerham, visited the fete and found out about Wolfe. £5000 raised for Help for Heroes Campaign. £1300 raised for Hospice in the Weald. 1300 people visited the exhibition at Squerryes and 1009 people visited Quebec House. Quebec House sold 340 raffle tickets and hit their target to restore the portrait of Mrs Wolfe. 120 re-enactors performed and camped at Squerryes. 11 re-enactors bought Quebec House to life. 35 traders sponsored and supported the event. 19 ballerinas gave the performance of their lives. To download the original program for the Wolfe Weekend click here. Read more about the life of James Wolfe and to read about Who’s Who in 1759 click here. To watch a short movie about General Wolfe and Quebec House, made by the BBC for the National Trust during the Wolfe Weekend, click the play button below.